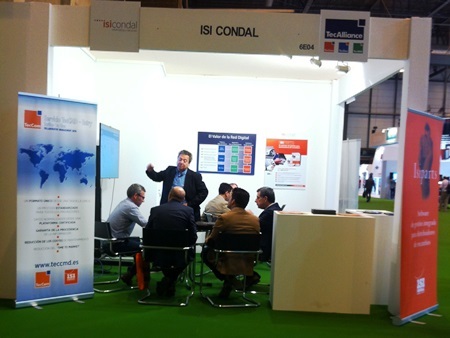 On 13 and 14 March 2015 the TecAlliance partner company ISI Condal presented the TecAlliance solution portfolio at the motortec automechanika trade exhibition in Madrid. The professional international trade fair, held every two years, has clearly established itself as the leading exhibition for the Spanish automobile business. Stand visitors showed particular interest in the possible combinations of ISI Condal solutions for merchandise management with the diverse solutions from TecAlliance. TecCMD, the market solution for article, price and logistic data management between supplier and trader in the automotive part business, was another strong focus of interest on the stand. TecAlliance employees Claude Lotrian (Director Western Europe & Latin America), Carlos Nieto Hernández (Telesales Spain) and Albert Badia (Sales Western Europe) were also available at the exhibition stand to answer questions and advise potential customers. For TecAlliance the participation in the exhibition was a big success, as shown by the very positive feedback from stand visitors during the whole time of the exhibition. The exhibition was an important step to raise the profile of the TecAlliance solution portfolio together with that of the partner company ISI Condal and to interest potential customers in Spain, Portugal, Latin America and North Africa.